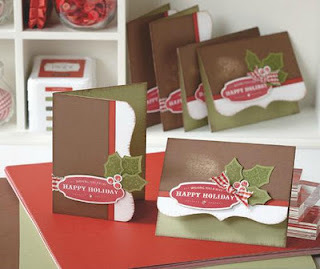 Each kit of 20 cards will be $25 or $20 with a $25 order. (If you are not local, please add $5 for shipping.) You are welcome to order more than one kit. Long distance kits also include step-by-step instructions and pre-stamped images. Contact me for more information, to sign up for this month's class, or to order your own kit(s). Please contact me no later than November 4th if you would like to join us or order a kit(s). If you would like to only make 10 cards for $15 let me know that too. To find out more about my monthly no-commitment Creative Club, click here. You do not need to be local to participate!